IAQ: How Important is the Air You Breathe? If you’ve got asthma,emphysema or pneumonia, you know the importance of breathing clean air. Particulates, chemicals, mold or even stale poorly ventilated air can cause problems for people with breathing issues. And since most people spend close to 90% of their time indoors, the quality of air you breath becomes important for health reasons as well. If an area is poorly ventilated and moisture is present mold has the chance to grow and multiply. 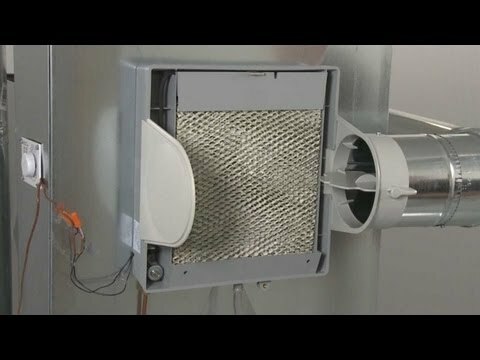 When it comes to removing particulates filtration using your homes forced air furnace is most commonly used. 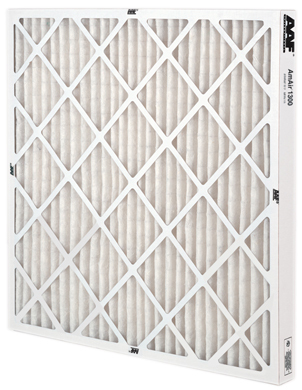 Usually a 1″ filter is used near the furnace or in a return grill recirculating air back to the furnace or air handler. Other times a higher density filter or electronic air cleaner is used and is able to capture even smaller particulates out of the air, resulting in even cleaner and healthier air in the home. Below are two types of 1″ standard filters. 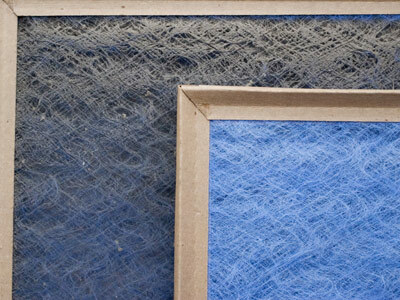 The blue is a woven fiberglass that has high air flow, but only catches large dust particulates. The white is a pleated filter which still allows for pretty good air flow, but must be changed often (30-45 days) as it will plug and restrict air flow. When higher quality filtration is needed. Filters with a larger surface area tend to catch particulates better. Also, filters that have an electrical charge and attract particulates do a fairly good job, but do let through some contaminants due to low surface area. 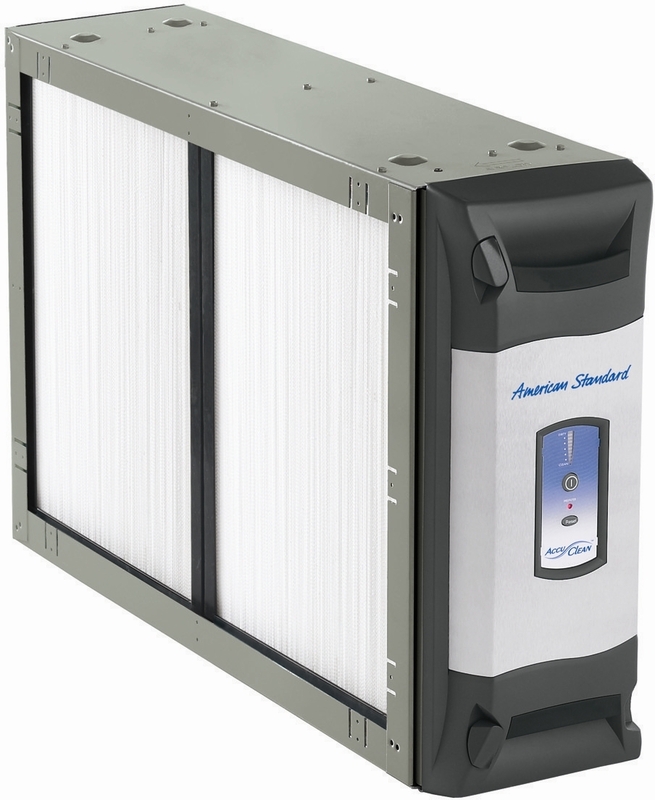 Although, we have found one electronic air cleaner that we feel is the best filtration unit on the market, and if your heating system can handle it (it does restrict quite a bit of flow) the American Standard Accu-Clean filter is able to remove almost all dust, dander, pollen, fowl food smells and mold spores out of the air, up to 99.98%. 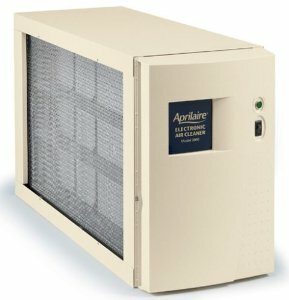 It is also up to 8 times better than any HEPA appliance. Source: American Standard. If you find yourself being shocked when you touch metal objects in your house or get bloody noses due breathing dry air, a humidifier may be for you. Installed on the duct system, humidifiers help keep your skin hydrated, your sinuses flowing properly and no more bleeding due to a dry nose. Here is an example of a whole house humidifier. The water is dripped down the honeycomb media as warm air is diverted past the media. A humidistat is installed to keep overall humidity controlled in the home and humidity is usually only added in the winter when conditions are the driest. I hope that I helped you learn something today and I hope that you will consider this when making Indoor Air Quality decisions in the future. If you have any questions feel free to call our office and ask away. 970-434-5348.